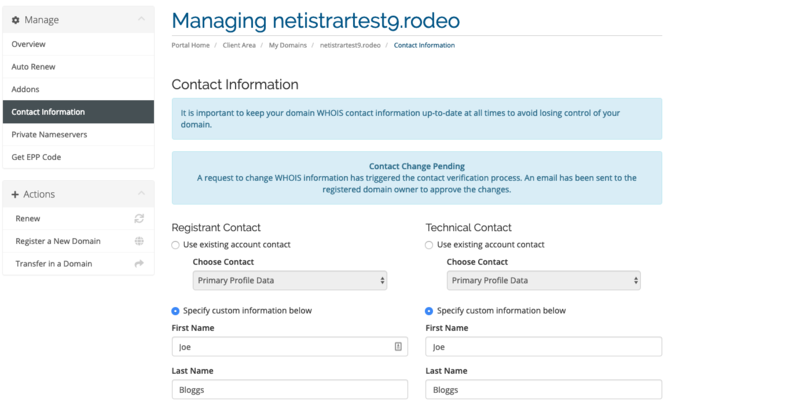 Once the Netistrar Registrar module has been enabled within WHMCS you are able to send customer orders for new domains and incoming transfers to Netistrar. Depending upon your specific configuration (and in particular payment configurations) this may be an automatic process or you may send orders manually to Netistrar once payment has been received. For completed domain orders, all of the core WHMCS domain management options are made available to your customers within the My Domains section of the client area. Manage Nameservers (NB: This is done from the My Domains listing via the tools dropdown). Under ICANN rules, any changes to the Registrant contact key fields for a domain name (Name, Organisation Name, Email Address) are subject to additional confirmation by email to the existing Registrant. Once these changes have been made using the WHMCS contact editor they will not be applied immediately but instead a validation email will be sent to the existing registrant to confirm changes. This is displayed to the customer in WHMCS with a message as shown below. Under ICANN rules, new domain registrations, transfers and changes to key Registrant data (as described above) attract a 60 day lock period where domains cannot be transferred away from the current Registrar. This is displayed to the customer in WHMCS with a message as shown below.